> Royal Caribbean International® > Sea Beyond The Ballroom And Book Your Next Event At Sea! Are you looking for a new and exciting destination to host your next corporate program? Rewarding incentives, memorable meetings and successful conferences are all business as usual aboard a Royal Caribbean International cruise. Royal Caribbean enables you to accomplish your program objectives by providing unparalleled value, ease of planning along with the delivery of a meaningful and memorable experience for you and your participants. When you start planning your next event, you'll understand why Royal Caribbean International is the destination of choice for so many corporate events! 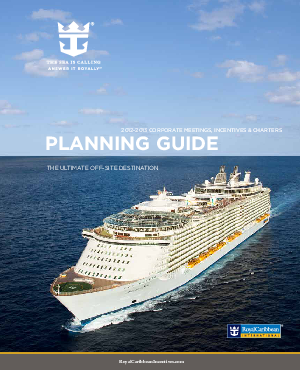 Download the 2012-2013 Corporate Meetings, Incentives and Charters Planning Guide to learn how Royal Caribbean can take your event to the next level.